As we wrap up the 8th season of the TOFHL, there are numerous important dates and rules to remind you of. After the Olympic break, we'll run into the NHL and TOFHL trade deadlines, followed by the all important roster freeze and the start of our playoffs. After that, we crown the 8th TOFHL Champion. Finally we select our keepers and begin the off-season. So let's break it all down so you can reference this if you have any questions. The NHL comes back on Tuesday, February 25th (Tomorrow) from the Olympics with just one game between the Sabres and the Canes, which means this week will be a shortened week. For this week there will A MINIMUM GOALIE REQUIREMENT OF JUST 3 GAMES. The NHL trade deadline is set for noon eastern on March 5th. So I like to have our deadline after that so we can see the player movement and adjust accordingly. In the early years of the TOFHL a team would make a trade for a player only to have them switch teams int he NHL and their role completely changes. So Yahoo! has the option for March 6th as the last day for us to make a trade, so we're going with that. So that means that 11:59pm is the last minute to complete a trade. Also, if it's a player for a pick trade, has to be emailed out to the league before the midnight deadline. 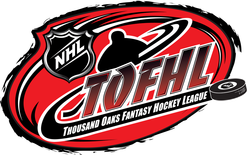 The TOFHL Playoffs and the Roster Freeze coincide with each other every year. This year you must have your minors and main club players in their finals spots, before we get to the first day of playoffs which is March 24th. Once we hit March 24th, you will no longer be able to move a player down to your farm, and all rosters will be locked going forward. The only way you can add a player to your roster is if you pull one of your minors up to the big club, (you can do that at any time, but you cannot replace him or send him back down) or if one of your players MISSES A START OF A GAME, you can replace that player through free agency if you have moves available to use. You must email the commish to do this for you. If you are a non-playoff team, you must follow the same rules. You may only replace a player on your roster if he gets hurt and misses a start. Waiver rules also apply to pickups during the roster freeze, however it will have to be done manually with an email sent to the commish with your intensions of using your waiver position to pickup a player. The Roster Freeze will hold all the way until we select our keepers and the off-season begins. Here are the changes we made during last years GM Meetings. As you can see we voted to move the start of our off-season back to the end of the Stanley cup playoffs. So the weekend after the Stanley Cup Finals are played out we will have the awards BBQ where we hand out the trophy's and money and the start of the off-season will begin then as well. Thats when we all need to select our 8 keepers and 3 minors. We also will reveal the draft lottery results during at the BBQ. I would love to have everyone there for this, so if you can make it, please try to attend. ZD and Nidetz, we will send the TOFHL satellite truck over to your house for a clear uplink of whats going on. Thanks for reading all this boring crap. As always, if you have any questions please email, text, or call me. - How has the player performed so far? - Will this player be a keeper for the foreseeable future? - Does the story line of a player being drafted warrant consideration for the cover? ie: break out player, a player that was passed over, or the 1st overall pick. Also at this time, I would like to revisit last year's cover boy and see if a recall is in order. After this vote, this player will be locked in for good! Below are the two polls. One for this year and a one for last year. Enjoy the voting! No Boundaries murdered everyone, especially in the player categories. He was the best team in 5 of the 7 player categories, as well as tied for 1st in goalie wins. MyGoodies was by far the best team when it came to stopping the puck. However, his goalies still haven't learned to stop Trevor from saying inappropriate comments. MyGoodies barely beat out Five Knuckle Shuffle putting a twist on their rivalry, which is the most pathetic rivalry in the history of the entire universe. If there are parallel universes, it would still hold true. The only way this rivalry could not be the most pathetic one all time is if a Trevor from a parallel universe transported into our universe and both Trevor's were in our league and they had a rivalry. That would be insane! Minority Report, our beloved President's Trophy winner, would have finished in 5th place. Coming in ahead of him in 4th place is MVB All-Stars, who we all know finished out of the playoffs. Craaazzzyyyy!!!! Team Shake 'N Bake finished in 2nd place somehow even with all his ridiculous trades, but their +/- of -62 is #1 in all of our hearts. Inside the TOFHL - Who is Your Biggest Rival? Ready to waste the next 4 1/2 minutes of your life? Here is the first ever installment of INSIDE THE TOFHL, enjoy! At last, we come to the number one ranked team. Team Shake 'N Bake has earned the top spot with just one vote not going to him as the top team. After becoming the first team to win the Presidents Trophy and the TOFHL cup in the same year, Team SnB now looks to become the first team to win the cup twice. In 2011 Dru saw his team finish outside of the playoffs for the first time, but what he did at that trade deadline and offseason set his team up for future success as is apparent now. When a team wins in this league, it usually means they exhausted most of their resources (picks and minors) in order to acquire players at the deadline and have success in playoffs. This was not the case as Dru was able to stash enough assets away from his off year to set him up for the 2012 draft while having a dominant team in the previous season. He set himself up with a bevy of early picks after winning the cup, not an easy task. That is just flat out good GMing. Team SnB selected three players in the first round of the 2012 draft. Thomas Vanek, Dany Heatley, and Niklas Backstrom. The Backstrom selection was key as uncertainty circles around the Luongo situation in Vancouver and Halak is set to split time again with Brian Elliot. His goalies might be the one weak link on this team. The forwards and defensemen are all solid and mostly in their primes. With The Presidents trophy winner now awarded money, it will probably be going home with Dru this year. This team is set up for success now and has a very good shot to repeat as champs. That being said, until his goalie situation is ironed out, this team is not flawless. It will be fun to watch the other top teams try to knock the reigning champs off their thrown. Here's to another great season (hopefully) and I hope you all enjoyed the Preseason Rankings. I will be doing Weekly Power Rankings which will be displayed on the main page on the right hand side. The Rankings will start in the order of these rankings and will be changed each week as I see fit. El Presidente took a fall from grace last year as he not only failed to win the President's trophy but failed to make playoffs for the first time in his TOFHL career. I believe two things lead to his demise this year and you are looking at one of them right here. While Getzlaf might be a great talent, it just doesn't seem like he has the heart to battle it out night in and night out. Winning the cup can do this to a player if they're not a heart and soul type player. The Ducks need to remove the "C" from him and take away that added pressure and just let him play his game. Having Getzy back to the way he was would really help No Boundaries get back to the dominating force he was in his first two full seasons in the TOFHL. The other issue was goaltending, and it surprisingly wasn't Kari getting injured but Cam Ward and the Hurricanes off to a slow "start" for the first half of the season. I believe with these two problems corrected No Boundaries could see himself back in the playoff picture. With Giroux now the top dog on this team everyone knows that No Boundaries has the fire power to compete with the big boys and it showed. No Boundaries was voted between 2nd (three times) and 6th (once) showing that this is a respected franchise. I believe that this team will make playoffs but might find it tough to get past the first round, it all depends how some of his core players bounce back. Tomorrow is #2, who we vote #1?MVB All-Stars or Team Shake ' Bake? This is a coming of age story. When ZD came into the league in 2008 he took over a team that had some parts but looked to be heading no where fast. He quickly made the decision to rebuild the team which ment trading some of the existing big name players like Hossa and Miller which wasn't easy to do. He new it would mean a few years of being a non-playoff team and at $50 a season it wasn't an easy decision. Fast forward to 2012, ZD has already made the playoffs, built a strong core of keepers led by Johnny T, added a co-gm in Nidetz, and now is ranked forth in the preseason rankings. Congrats kid, you took a team and completely re-built it into a legit playoff team. Now that this team has paid their dues, it's time to take the next step and win some money this year. This team is very capable of finishing top three and maybe even win the cup. We all know about Tavares, or so we think. I believe we will see him start clicking at a 90+ point pace (with a chance at 100) moving forward. He is a great centerpiece for this team. The Duche has had his struggles but remember he dealt with injuries. Now that he's back up and running don't forget about him. Then he goes out and adds Calder Trophy winner Gabriel (Great Name) Landeskog in the 2011 draft and we haven't even gotten to James "The Realest of Deals" Neal, and Marian Hossa. This team is built to win and win they will. In this years draft, ZD and Nidetz decided on taking Teddy Purcell in the 1st round who could end up being a keeper at the end of the year as it looks like he'll line up next to Stamkos. Pro-Ho also picked up Brian Campbell on D who I think is pretty underrated as he finished 2nd in defensive scoring last year behind Erik Karlsson. Their goalie situation is just looking great too, they are solid all the way down (if you know what I mean ;). Jimmy Howard has now established himself as the guy on one of the best teams in the league year after year. Ondrej Pavelec seems so have a ton of raw talent and we all know #Jestareblowingupthisyear (make the shirts Johniya!!) so he will benefit from having a good team in fornt of him. Lastly Lindback now gets a chance at becoming a number one as he was moved to Tampa this offseason. This team is set to do some damage. When it comes to the rankings for this team, the highest they were voted was 2nd and the lowest was 9th. Many GM had this team 3rd on their list though (5). My guess is this team will make the semis's this year and will def have a chance at their first TOFHL Cup. Finally we get to the top 3 next week, The money spots! How much are you making? Welcome to the Playoffs!! Just kidding, you've got a long way to go before you actually get there. But the GOOD news is your piers think your team has what it takes to make the playoffs or at least come real close to making it. The Good Sirs' have been a team in flux the last few years. Since the TOFHL was established in 2006, four teams have made the finals twice. 3 of them (Gorilla Warfare, VonderKats, and Team Shake 'N Bake) have won the cup. The only team to not win the cup after two appearances in the finals is, you guessed it, The Good Sirs'. They will be looking to get back into the top tier of the league after a couple of off years. The engine that drives this team is The Great 8, who turns out would wear 32 had it not already been retired by the Caps. When Ovi is on his game he is a stat stuffing machine and will elevate Backstrom to another level who The Good Sirs' have as well. So if Cole is going to make a 3rd crack at the finals Ovi will need to find his dominating game again. The Good Sirs' were ranked as high as 2nd and as low as 9th. Even though there wasn't much prep done by Cole for the draft this year he actually had a pretty strong showing by looking at his picks (see here). He has a solid roster of forwards and defense and when it gets down to his goalies he ain't to shabby there either. With Rinne leading the league in wins last season and nominated for the Vezina he can lean on him when need be. Tomorrow is #5, the last team ranked in the middle 3rd of the league. Tim Thomas might have really put a damper on this season (if there is a season) for the VonderKats, but that is no longer an issue. With Ryan Miller already in his back pocket, Erich made an offseason trade that saw Taylor Hall shipped out and The Flower brought in. This franchise has been one of the most successful in TOFHL history due to it's strong goaltending and scoring by committee and thats exactly what they are set up for again coming into the 2012-13 season. People may just remember Fleury as the the goalie who fell coming out for a Stanley Cup final game (see here) or his playoff series against the Flyers where goals where being passed out like condoms at Cole's Halloween parties. But look again, you'll see that Fleury is on one of the best teams in the league and now has a solid backup to push him to new heights. Fleury finished last season just one win behind league leader Pekka Rinne with 42. With him and Miller manning the nets for the VonderKats, it's gonna be a tough go to beat them in any tendy cats. What is their strength could also turn out to be their weakness as there are currently 6 goalies on the VonderKat's roster leaving less room for players. With their scoring by committee approach they will want as many forwards as possible to add up those player cats to be competitive on both sides of the puck. A trade might make sense here to eleviate a goalie spot and add a player, but with the season not yet started, this might just be a wait and see situation. The VonderKats are a perennial force in the TOFHL as they have made the playoffs every year but one they've been in the league. They have their name on the TOFHL Cup (MesEx) and followed that up with a President's trophy the following year. It's interesting to note that this team was the most middle of the road team in terms of votes with just one falling outside the 4-8 range (10). With all the accolades this team won through the years it will be interesting to see if they can overcome the loss of great keeper in Tim Thomas and hold onto a playoff spot this year. Tomorrow #6 is revealed, so that means our 2012-13 playoff group starts tomorrow. Where will you land? I believe the one player that holds the key to Minority Reports season is Varly. We all know what Lundy will bring, but the x-factor is Varly. He is having an outstanding season thus far in the KHL and he'll be looking to carry that play back over here when (if) the season ever starts. Currently he is 2nd in Save % in the K with a stellar 94.2. Johniya has made the playoffs twice in his first 5 years in the TOFHL. You shouldn't underestimate this team though as he finished 3rd in the regular season with 265 points last season. Another contributor to this team that needs to step his game back up is P. Kane. With Minority Report finishing 3rd it's scary to think what if P. Kane played up to his potential last year. How deep could this team have gone? As per usual, Johniya didn't have a pick until the middle of the 2nd round where he selected Derek Roy who found a new home this offseason in Dallas. In the middle rounds, he found some young defensemen in Cam Fowler, OEL, and Stefan Elliott who all have huge upside and could breakout at any time. OEL has been so good in his short career that Phoenix has entertained the thought of trading Yandle, which says a lot. Erik Johnson is his 4th defenseman who is also young and has some potential as he was selected 1st overall in the NHL in 2006. If he can find his game, this defensive core could be the best in the league. This was another team that was all over the board. Minority Report was ranked as high as 3rd (twice) and as low as second to last (twice). The final result will depends on if P. Kane decides he wants to play and not party at colleges anymore, and if Varly and Colorado can take it to the next level which I believe will happen. #7 slotted for Tuesday! The last team NOT to make playoffs. Commissioner of the best damn Fantasy Hockey League in the world.